To get beautiful skin is the motto of each and every woman. She would try out different things, which suits her skin and would make her look more attractive. There are ways with which beauty could be achieved. Either try out chemical-filled creams and lotions or try natural face packs. There are many face packs, which could be used to keep the skin moisturized and increase the glow of the skin. - Use of milk cream is the considered as a good option for dry skin. Massage your face and whole body with milk cream for 5 minutes and leave it for 10 minutes. Then wash your skin with cold water. You will see instant glow and with its regular use you will get soft and smooth skin. Along with increasing brightness, it will also help in keeping the skin moisturized. - Fuller’s earth is also believed to make the dry skin smooth and keep it moisturized. Mix it with rose water and tomato juice, apply this mask on the face, and after 20 minutes wash it with cold water. Rose water and tomato is included as it helps in increasing the brightness of the skin. - Tomato is very good for skin as it helps in making the skin shiny. Mix tomato juice and lemon juice and then massage your body or just face & neck with this liquid. Your skin will become soft and smooth and you can see the glow on the face. - Aloe vera is very good for the skin. It helps in making it smooth and increases the brightness of the skin. You can use aloe vera creams/gels available in the market, massage your body with it properly and then wash it off with cotton swabs dipped in water. You can also use the natural aloe vera leaf, cut the thorns on the leave and the pulp which comes out, apply it on the face and neck. - Among the fruits, avocado is considered as a good choice for a face pack. Simply mash avocado and use it as a mask for your face. Keep it on the face for 20 minutes and then wash your face with lukewarm water. There is another way of making a face pack with avocado. Mix the mashed avocado with egg yolk and olive oil/almond oil and use this pack on the face. By using avocado regularly you will see that your skin gets brighten and remains moisturized. - If you use face pack made up of egg yolk, honey and milk powder, then you will see that the brightness of your skin and face has increased. Your skin will glow and look shiny with the use of above mask. Apply it on the face and leave it for 20 minutes. Then wash it off with cold water or lukewarm water. 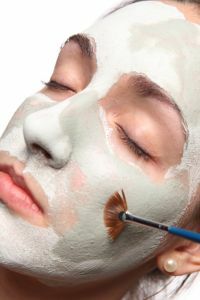 Along with the above face packs, you can use banana, papaya, almonds, honey, apples and yoghurt to make different masks. Use of face packs is recommended as it helps in increasing the glow of the skin and keep the dry skin moisturized which is an important point to be considered.